Smeg SX91VML-5 fascia sticker set for worn fronts, all variants. Bush BEDC50S, BEDC60S,W,B Fascia sticker set. BOSCH 5000 SERIES Oven fascia sticker set. NEFF 4 & 5 ring gas hob vinyl stickers. NEFF B1ACE4H.0B Oven fascia sticker set. NEFF B1DCC0AN0B front fascia sticker set, two sets on one sheet. NEFF Stickers for Oven handles etc x 4. NEFF U12S32N3GB, B12S22N3GB oven plus others, fascia stickers. 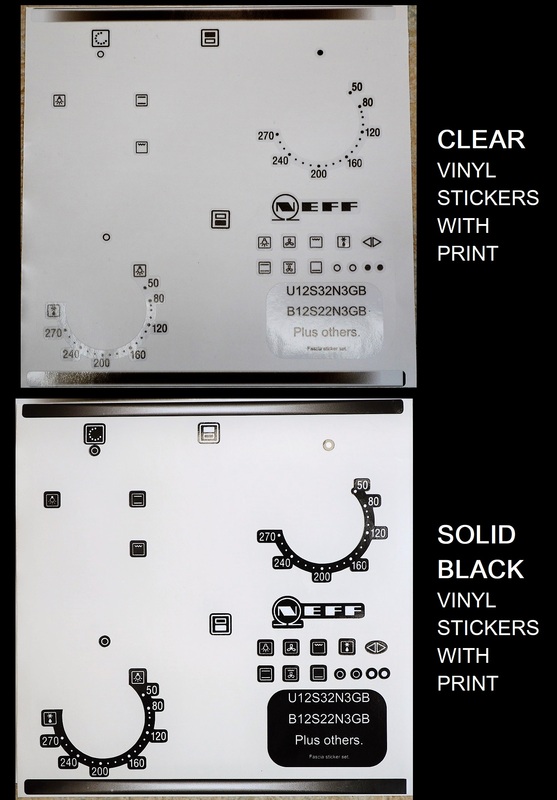 NEFF U1DHC0AN0B Oven fascia panel sticker set.